April 19, 2017 – At the center of the Centaurus galaxy cluster, there is a large elliptical galaxy called NGC 4696. Deeper still, there is a supermassive black hole buried within the core of this galaxy. New data from NASA’s Chandra X-ray Observatory and other telescopes has revealed details about this giant black hole, located some 145 million light years from Earth. Although the black hole itself is undetected, astronomers are learning about the impact it has on the galaxy it inhabits and the larger cluster around it. 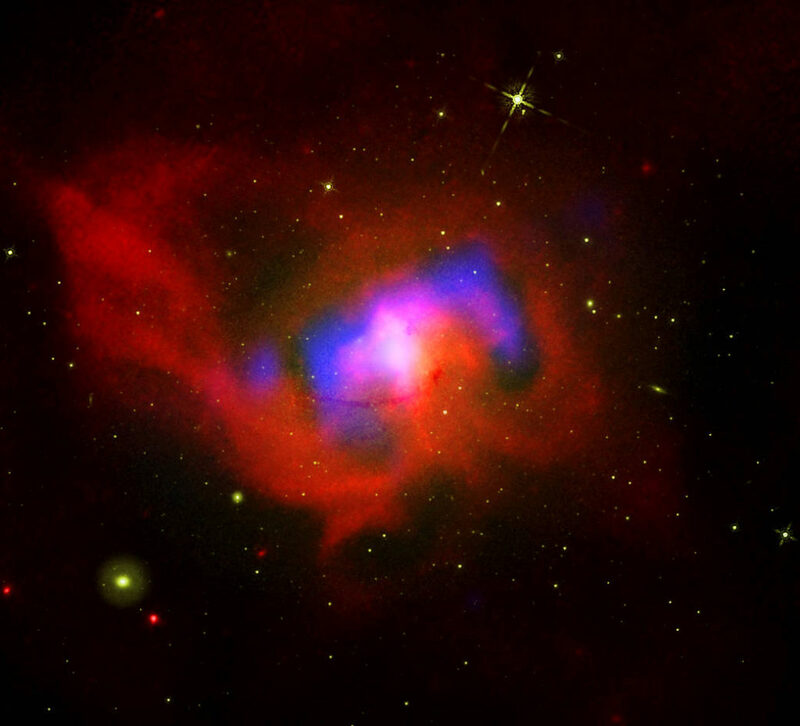 This composite image contains X-ray data from Chandra (red) that reveals the hot gas in the cluster, and radio data from the NSF’s Karl G. Jansky Very Large Array (blue) that shows high-energy particles produced by the black hole-powered jets. Visible light data from the Hubble Space Telescope (green) show galaxies in the cluster as well as galaxies and stars outside the cluster. Astronomers employed special processing to the X-ray data to emphasize nine cavities visible in the hot gas. These cavities are labeled A through I in an additional image, and the location of the black hole is labeled with a cross. The cavities that formed most recently are located nearest to the black hole, in particular the ones labeled A and B. The researchers estimate that these black hole bursts, or “beats”, have occurred every five to ten million years. Besides the vastly differing time scales, these beats also differ from typical human heartbeats in not occurring at particularly regular intervals. A different type of processing of the X-ray data reveals a sequence of curved and approximately equally spaced features in the hot gas. These may be caused by sound waves generated by the black hole’s repeated bursts. In a galaxy cluster, the hot gas that fills the cluster enables sound waves – albeit at frequencies far too low for the human hear to detect – to propagate. The features in the Centaurus Cluster are similar to the ripples seen in the Perseus cluster of galaxies. The pitch of the sound in Centaurus is extremely deep, corresponding to a discordant sound about 56 octaves below the notes near middle C. This corresponds to a slightly higher (by about one octave) pitch than the sound in Perseus. Alternative explanations for these curved features include the effects of turbulence or magnetic fields. The black hole bursts also appear to have lifted up gas that has been enriched in elements generated in supernova explosions. The authors of the study of the Centaurus cluster created a map showing the density of elements heavier than hydrogen and helium. The brighter colors in the map show regions with the highest density of heavy elements and the darker colors show regions with a lower density of heavy elements. Therefore, regions with the highest density of heavy elements are located to the right of the black hole. A lower density of heavy elements near the black hole is consistent with the idea that enriched gas has been lifted out of the cluster’s center by bursting activity associated with the black hole. The energy produced by the black hole is also able to prevent the huge reservoir of hot gas from cooling. This has prevented large numbers of stars from forming in the gas. A paper describing these results was published in the March 21st 2016 issue of the Monthly Notices of the Royal Astronomical Society and is available online. The first author is Jeremy Sanders from the Max Planck Institute for Extraterrestrial Physics in Garching, Germany.